Is outside air kit or inside air best for my stove? All appliances that burn fuel need air (e.g., furnaces, boilers, and hot water heaters). 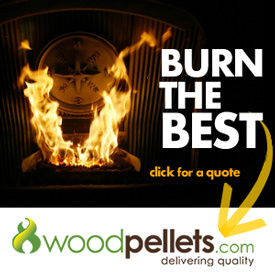 The significant difference with burning wood pellets for heat is that it is taking air from your living space. This means that the house is depressurized as the fire consumes air and sends it up the chimney. This depressurization causes air to be sucked in from outside through ever window, door, and crack in the house (basically, the path of least resistance). This can make the house feel drafty and colder than it really is. An outside air kit (sometimes referred to as OAK or Exterior Air Kit) allows you to pull this combustion air from the outside of your house. This keeps the cold combustion air heading directly into the stove as opposed to blowing across the room. Outside Air Kits can be the best solution to making the house feel less drafty and more comfortable. This means that you’re burning fewer bags of pellets each heating season. Fewer bags means less money spent on fuel and less time spent filling up your stove over the course of heating season. Outside Air Kits are a required installation for trailer and mobile homes and also help combustion in modern houses with very tight envelopes. While less of an issue in an old, leaky house,some argue that it is healthier to have fresh airflow through your house. We recommend including an outside air kit in your installation for maximum burn efficiency and then opening a door or window when you feel the need for fresh air.